After greeting your guide at Spitalfields Market in Shoreditch, browse the eclectic collection of restaurants and stores before refreshing with coffee at a trendy café (own expense). During your coffee break, you’ll inform your guides of the sights you wish to see and relish the opportunity to customize your tour. Head first to Brick Lane — a stretch famed for its traditional Indian eateries and vintage clothes stores — and absorb its vibrant atmosphere. Revitalize with Indian specialties at a restaurant recommended by your guide (own expense) before browsing pieces created by local artists in contemporary galleries. 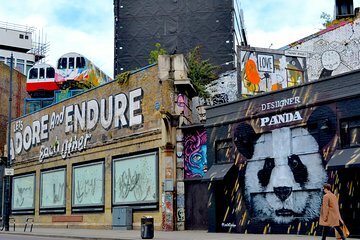 Then, stroll to the Old Street area — renowned for its thriving nightlife scene — and discover hidden treasures before bidding your guide farewell at Old Street underground station. Adrian gave me a very special, very interesting and very enjoyable introduction into the multi-faceted and changing East London. Highly recommended!